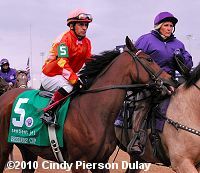 Jockey Jamie Theriot and Filly and Mare Sprint winner Dubai Majesty. The $1 million Sentient Jet Filly and Mare Sprint (G1) featured a field of 13 older fillies and mares going 7 furlongs around one turn of the main track. test Stakes (G1) winner Champagne d'Oro was sent off as the 9-2 favorite off a fourth place finish in the Thoroughbred Club of America Stakes (G2) at Keeneland. 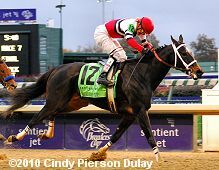 In to challenge her included 5-1 second choice Sara Louise, winner of the Top Flight (G2) before finishing third in the Gallant Bloom (G2), and 6-1 third choice and defending champion Informed Decision, third in the Thoroughbred Club of America after winning the Presque Isle Masters (G3). Dubai Majesty draws away from Switch with Evening Jewel behind them. 8-1 Gabby's Golden Gal battled for the lead with Champagne d'Oro down the backstretch through fractions of 22.56 and 45.44. On the turn, 9-1 Dubai Majesty, who stalked them in third early, came out 4 wide and ran past the pacesetters to open a 3 length lead in mid-stretch through 3/4 in 1:09.61. 8-1 Switch put in a late rally of her own but was left with too much ground to cover, as Dubai Majesty cruised under the line 2 1/4 lengths clear in 1:22.31 over the fast track. 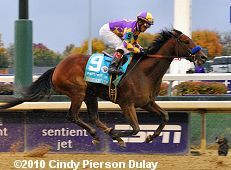 It was a long 3 lengths back to 8-1 Evening Jewel third, and another 1 1/2 to favorite Champagne d'Oro fourth. Dubai Majesty wins the Filly and Mare Sprint. 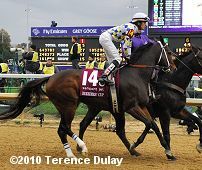 Left: Dubai Majesty heads to the winner's circle. 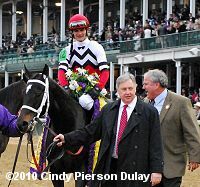 Trainer Bret Calhoun said, "She loves this racetrack. She made a great move and Jamie rode a great race. She was making an easy move and then she got into gear and I got really excited. Jamie did a great job of getting her settled back, and then she dragged him up there. I've gotten pretty excited before and then she's gotten beat, but this time she got there. She did great. She's trained extremely good. We all decided to supplement (her to the race) together." Right: Dubai Majesty in the post parade. Jockey Jamie Theriot, celebrating his first Breeders' Cup win, said, "This is a big first for me after 13 years of riding, working 7 days a week. She broke like a shot and put me in a perfect stalking position. The speed cleared me and I was going just great. She was well within herself. On the turn, she took a deep breath and grabbed me and took me to the lead. When we made the 1/4 pole, I said 'That's it. I ain't gonna get beat today'." Left: Second place finisher Switch runs out after the finish. Trainer John Sadler said, "We're thrilled with the race. She was a little unlucky. She never really got clear down the backside and she got banged around a little bit coming between horses, but she showed a lot of good energy and closed well." 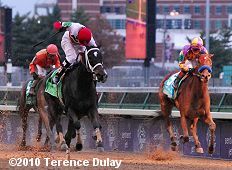 Jockey Joel Rosario added, "The winner was too good. We were second-best. I kind of got between horses and I never had time to get her out. I wanted to be a little closer, but I had nowhere to go. 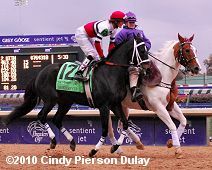 She was going good in the end, but the other filly was going better." Right: Third place finisher Evening Jewel in the post parade. 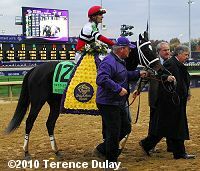 Trainer Jim Cassidy said, "I thought we broke a little tardy, which is not normal for her. It probably got us back a little further than we wanted to be. He (jockey Victor Espinoza) said he got bumped a little bit on the turn. I didn't see it. We had to go a little wide and lost some ground, but she tries so hard every time. What can I tell you? She just runs. I don't care where you run her or how far. It wasn't great, but it was good." Fourth place finisher and beaten favorite Champagne d'Oro in the post parade. Under jockey Miguel Mena, she contested the pace while 2nd or 3rd then tired in the final furlong to finish fourth beaten 6 3/4 lengths.